Reupholstery Services | J R Upholstery and Blinds Inc.
We offer a large variety of new booth packages, from standard restaurant booth seating frames and upholstery to elaborate and ornate booth seating frames and upholstery, to fit your building. 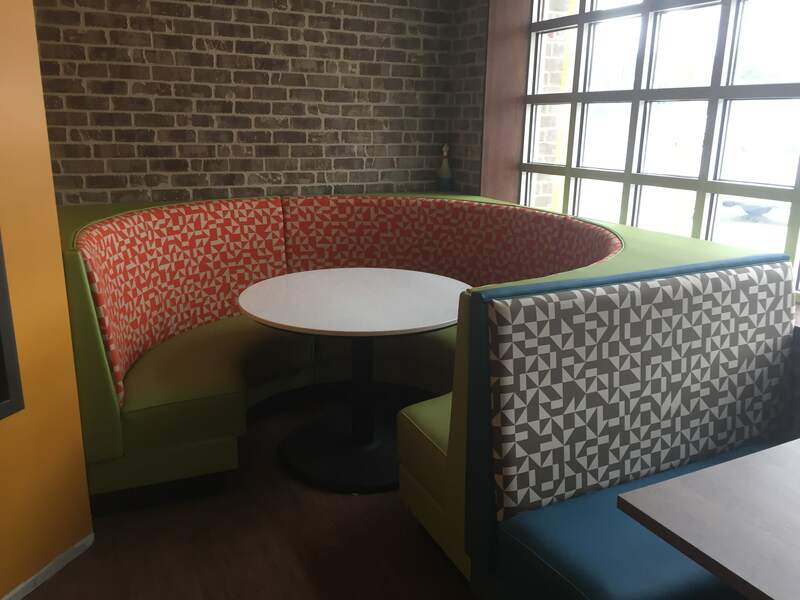 We can customize to your needs and work within your budget to get the feel and atmosphere you’re looking to create. Choose from an endless variety of vinyl, leather, or leather-like materials and colorful patterned or monotoned fabrics to make your building project or remodel come to life. We are experienced and experts at making used or torn upholstery new again. We service many of the famous restaurants you eat at all the time. We replace worn or torn coves, worn out foam, fix or replace broken springs, or remove existing springs and replace them with new wood and foam. We also specialize in doctor office exam tables, physical therapy tables, chiropractor tables, gym equipment repair, couches, lounge chairs, kitchen chairs, and much more! We can also supply your office with new waiting room chairs, desk chairs, and or reupholster your existing office seating. We can supply your restaurant with new chairs and bar stools or we can reupholster your existing chairs and bar stools. We also reupholster or supply new dorm room and college furniture. We can supply your restaurant with new tables and chairs. We will come to install your new tables and chairs and remove your existing ones if so desired.